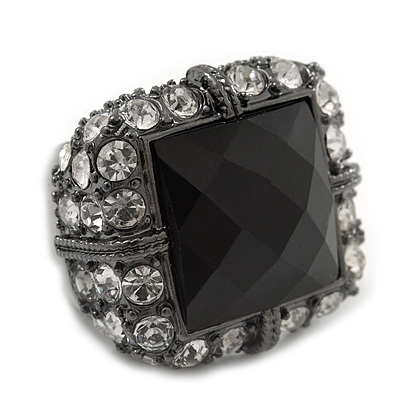 Vintage glamour meets a modern vision with this Faceted Black Glass Square Stone and Diamante Gun Metal Stretch Ring. This is the kind of ring that will soon become your favourite accessory, if not for it's comfortable modern design, then for it's brilliant sparkle. The station of the ring features a square cut, black faceted glass gem, which simply shimmers with style and class, surrounded with crystal clear diamante gems, fitted onto a wide gun metal stretch band which measures 10mm in width. The station itself measure 25mm across. This ring will make the perfect gift for a fashion-conscious lady!